Bilsland's Blog | Here be dragons. I’ve recently been reading Francesco Nepitello’s The One Ring roleplaying game. Chris Tulach picked up the book for me at Gen Con, after I mentioned how impressed I was by its aesthetic style. The one element of the book that interested me most was the “Fellowship Phase,” which addressed a question that had nagged me for some time: What is the best way to capture the time in between adventures in roleplaying games? Let me preface my answer with a bit of explanation: I run games laden with intrigue and sweeping plot arcs. I juggle multiple storylines, each with a write-up. I invest time creating elaborate background for nonplayer characters and player characters. The problem is, when you’re only meeting once every other week for five or six hours, you can only relate so much of all that story over the course of a game. To that effect, I’ve taken inspiration from Nepitello’s system and created something suitable for my own needs, and I call it: Campaign Mode. Campaign mode isn’t for everyone, but I hope some people find it useful. My hope is that I might actually be able to use the following rules set to (a) wrap up all the character story lines and (b) include some players who have left the campaign due to relocations. This system is still something I’m developing, so please comment with your feedback. If you’re a player and not a Dungeon Master, I still welcome feedback, and if you like what you see, please encourage your Dungeon Master to take a look. Campaign mode is a new instrument in a Dungeon Master’s toolbox for time and story management. It can be used to pass days, months, or even years, without forcing either the players or Dungeon Master to go into great minutia about the actions taking place in the campaign world. As a Dungeon Master, you should decide whether or not campaign mode is right for your game, though it’s a good idea to take into consideration the types of players at your table and to consult them before introducing it. Time in a Dungeons & Dragon game normally flows in three ways compared to game table time: either at a fractional pace, an equivalent pace, or at a moderately accelerated pace. For example, time flows at a fractional pace during combat. The time “in game” is only a fraction of game table time. In 4th edition Dungeons & Dragons, one combat (five minutes) is about an hour at the game table, or approximately one-tenth game table time. Exploration or social interaction occurs at an equivalent pace. You say what your character says to the nonplayer character, or alternatively, in the time it takes you to explain that your character is searching the room and roll the die, the character could have made a good start on his or her search. Finally, game time proceeds at a moderately accelerated pace. You might explain to the Dungeon Master how your character spends his or her day in town, or how the part is traveling by horse to a nearby cave. 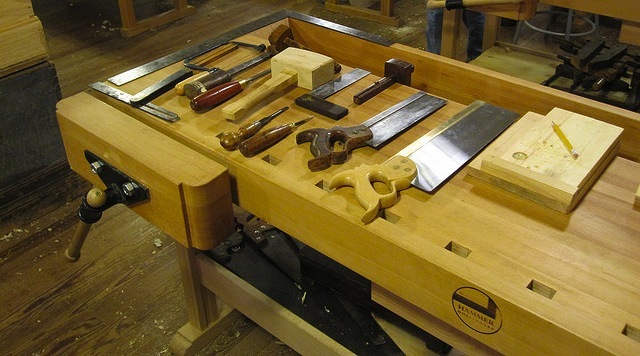 In this case, the game time might be equal to anywhere from one-hundred to one-thousand times the game table time. That is, it takes you 1 minute to explain what your character is doing, and in that time, a couple hours might pass, or a day might pass. Nothing in the game limits escalating of this system of time to a higher magnitude. Why shouldn’t a player be able to explain what a character does over the course of a week, a month, or even a year? In a traditional Dungeons & Dragons game, the answer to that question is that the adventure or the campaign doesn’t allow it. A Dungeon Master can’t have his or her players saying “I spend the next year of my character’s life going to recover the Rod of Seven Parts.” For one, it puts a Dungeon Master in the awkward position of telling that player to not bother showing up for the next session, plus all the sessions after that. It is also impractical because a Dungeon Master can’t just let the players complete quests without challenge. For that reason, a Dungeon Master should decide whether to use campaign mode in his or her game, and when to use it. Once you decide to use campaign mode, ideally with consulting your players, you should provide or communicate the following rules to them. Initiate: A Dungeon Master initiates campaign mode at the end of a rest, generally in a safe location, such as a town. However, in order to expedite travel through wilderness, a Dungeon Master might decide to initiate campaign mode during a rest while the heroes are traveling through or exploring harsh or dangerous environs. The Dungeon Master can announce that the game is entering campaign mode or can do so through the narrative. For example, you might state that in subsequent days, travel passes uneventfully, and it looks as though the party faces no immediate threats and has no pressing matters to address. Determine Timespan: Both the players and the Dungeon Master determine how much time passes. Before asking the players how much time they want to spend in campaign mode, you determine the upper limit of time the characters can spend. This amount of time should generally not exceed 5 years, and it is usually limited by events related to the campaign. Villains are unlikely to let the characters relax for too long, and threats of war and the promise of treasure can interrupt the actions characters perform in campaign mode. Determine the maximum timepsan by choosing an increment of time. Also, decide what campaign event, if any, interrupts the characters actions in campaign mode. After you’ve decided upon the timespan and campaign event, it’s time for the players to decide how much time to expend. This decision should be a collaborative process, in which the players examine their characters’ goals, obligations, and interests, and then come to a consensus. If a consensus is not possible, you can deal with the disagreement in two ways: go with the length of time the majority of the players want, or go with the minimum amount of time a player proposes. Determine Actions: Once both DM and players have decided on a timespan, each player decides how to spend his or her actions during that time. A player chooses how to spend his or her actions based on the entire unit of time. For example, a player can’t break a month down into several week-long increments, or a year down into twelve month-long increments. A character’s activities in campaign mode are represented by two types of actions: a major action and a travel action. A major action, similar to a standard action, makes up the bulk of a character’s activities during the campaign mode timespan. A travel action, similar to a move action, represents a character traveling some distance overland, based on what can be accomplished during the timepsan. Going around the table, each player tells the DM how his or her character will spend these actions during the timespan, and in what order. Whether or not a proposed task can be accomplished within the timespan is determine by the Dungeon Master. If a player’s proposal is too ambitious, let the player know how long his or her character expects the action to take. At your option, you can allow a player to accomplish part of his or her major action if time runs out or if an event interrupts the action (see “Unfinished Business”). Here are some general suggestions for what a character might accomplish with his or her major action. Education: Retrain your character classes, learn a hard language, adopt a new career requiring years of training, such as captain of the guard, general, a guild leader, a governor, a chieftain, a physician, an abbot, or a high-ranking member of the clergy. Relationships: Start a family, develop a vendetta, gain a nemesis, train a dangerous or untame beast, rekindle a friendship with a long-lost family member, gain an apprentice, develop a lifelong friendship with a person or a rapport with the citizens of a city. Education: Attend a university, train a domesticated beast, retrain your theme, skills, feats, powers, or class features, learn an easy language, adopt a new career requiring considerable training, such as a knight, a lieutenant in the army, an armorer, aweaponsmith, a metalsmith, a merchant, a mayor, a constable, a steward, a scholar, an innkeeper, an apothecary, an animal trainer, an artist or performer, an acolyte, or a mid-ranking member of the clergy. Relationships: Get married or develop a relationship, gain a reputation for something incredible, develop a rivalry, develop a strong friendship with a person or a rapport with the citizens of a large town. Education: Research an obscure organization or esoteric subject, train a simple domesticated animal, retrain one of your skills, powers, or class features, learn fragments of a difficult language, become a squire, a soldier in the army, a mercenary, an apprentice armorer, an apprentice weaponsmith, an apprentice metalsmith, a counter, a scribe, a stablehand, a deputy, a server, or a low-ranking member of the clergy. Relationships: Fall in love, meet a rival or adversary, gain a reputation, develop a good friendship with a person or a rapport with the citizens of a small town. Education: Read a tome, decipher a faded scroll, research a widely documented organization or subject, train an intelligent domesticated animal, find out the local rumors or legends, retrain one of your powers, learn fragments of a common language. Exploration: Track down an elusive local object or a person that hasn’t been seen or heard from in weeks, explore a local forest or mountain, gain insight or hints into completing a quest. Do you have some suggestions? Something else you want to see integrated? Help me playtest this system and build more robust options for characters. When I’m finished, I’ll compile all the rules into a single, easy-to use document. Yesterday, I saw this post for the nine alignments of Game of Thrones, and it got me wondering, has anyone made a nine alignment chart for Doctor Who? A little searching revealed only this chart for the different generations of the Doctor. 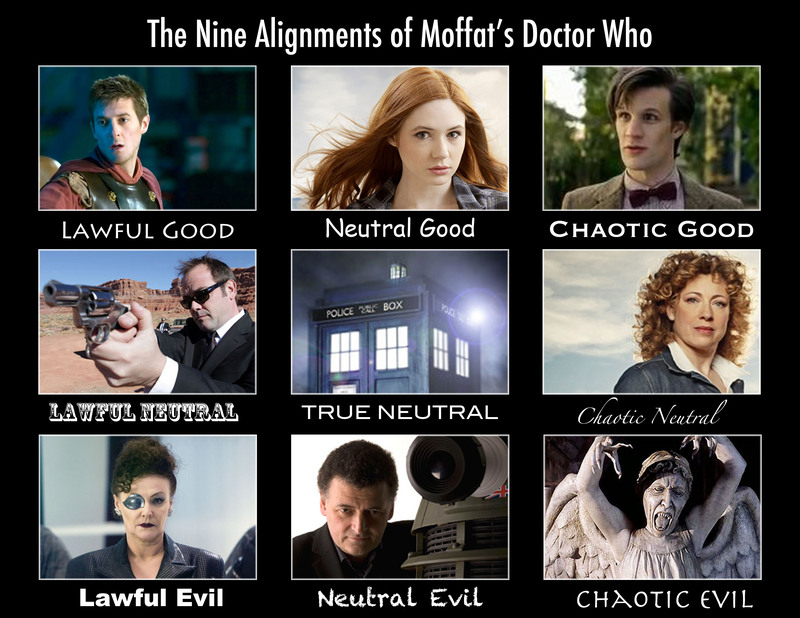 I didn’t find what I wanted, so I decided I’d whip up my own nine alignments chart for the Moffat tenure of Doctor Who. If you’ve kept up with this season of Doctor Who, this chart is spoiler free. If you haven’t watched “A Good Man Goes to War” yet, then there might be some spoilers. Here’s what I came up with. I debated where to put the Silence (organization), the Silence (aliens), and Madame Kovarian. They probably also could have worked as neutral evil, but I like my solution. We’ve all been cruelly tormented by Moffat this season, so I think we know where he belongs. There are plenty of other characters that would have worked, but I wanted to pick the recurring characters. As with any show that has characters with complex motivations, the chart only works so well. And who knows what will happen in this season’s finale. Moffat has surprised us before, and I wouldn’t put it past him to do it again. Read aloud text, or boxed text, as it’s sometimes called, has been a staple of D&D since the earliest adventure modules. The shaded boxes told Dungeon Masters what to say to players, typically verbatim, and often at length. Boxed text comes from an era in which the rules for how a Dungeon Master should run his or her game were just that–more like rules, and less like guidelines. So the question is, has read aloud text in adventures outlived it’s usefulness, or does it remain relevant as a tool or as part of the tradition of D&D and other roleplaying games. I put the question to Twitter, and by and large, the Game Master’s there felt that read aloud text was useful only in that it contained important facts to be conveyed to the players. Most people did not read the text verbatim. The resounding opposition to traditional read aloud text, in favor of something such as bullet points, suggests the biases of that audience, though. The folks who responded are experienced Game Masters, who are accustomed to improvisation and adaptation. In that respect, perhaps the most appropriate place for traditional read aloud text is in adventures for new Game Masters, such as in in the Dungeon Master’s Kit. The adventures in Dungeon magazine, for example, might not mandate the same treatment. Dungeon Masters have an awfully lot to worry about. Read aloud text is a boon to the lazy DM, or the DM who doesn’t have time to prepare. It can give him or her a much needed break during the session–a singular place where the Game Master is not put on the spot to conjure dialog or a description out of thin air. Yet is the convenience an illusion? How often do we Dungeon Masters start reading a passage and then begin modifying the text halfway through it, or cut it short with a “blah, blah, blah?” Maybe the the characters have torches instead of sunrods, or maybe the mood is wrong, or maybe the read aloud doesn’t contain an essential detail the DM wants to convey. I think anyone who has ever relied on read aloud text has had the same experience: reading a pasage and realizing it is silly, doesn’t make sense, or doesn’t contain the important information. Some GMs can just excise or improvise on the fly, but if you’re not one of those people, a question then: Is there some better way to communicate with you, so that you can communicate effectively to your players? We DMs have all read boxed text that sounds contrived, forced, or awkward. We’ve read swathes of text, in which we stop halfway through after players get that dazed look in their eyes (level + 3 vs. Will). One of the fundamental problems with read aloud text is that it causes you to disengage with the players. On Twitter, @TheSheDm pointed out the importance of eye contact. Reading the text in advance helps, but each glance down at the page tells the players that they’re on the railroad. The more you can avoid reading directly from the page, the more your players will feel as if they’ve paved their own way through an adventure. I like the point @childlikerobots makes: read aloud text should have an objective. It might be to set the scene, or it might be to drop an important detail about an area, or to communicate details about the plot. If you simply read a block of text on the page, it’s not necessarily clear what the important elements of the text are. Is it the walls, which are made of red stone, or is it the skeleton, lying in the corner. If the DM can’t tell what’s important, the player certainly aren’t going to be able to. Contains new information (I don’t need to know the walls are still made of stone). Succinct. Not more than fifty words. I agree with the point that @Deadorcs makes: In general, read aloud is bad for dialogue and good for setting a scene. It’s difficult enough to put words into the mouth of a DM, without making it dialogue. Trying to capture the proper inflections, tones, and mannerisms in dialogue is even more challenging. With that being said, we do just that in the next season of D&D Encounters, Beyond the Crystal Cave. Why is that an exception? Because sometimes read aloud needs to evoke a specific mood. You wouldn’t use the same words or speech for boxed text in Ravenloft that you’d use in Madness at Gardmore Abbey. The best read aloud text creates a mood, as well as images. If it’s just intended to convey the fact that a room is 20-by-20-feet with stone walls and a treasure chest in the middle, perhaps that’s best left to the GM to convey. So boxed text has its uses. It can convey mood, help new DMs, and, as @MetaDM points out, creates a shared experience in Organized Play. By the same token, read loud text can be confining to the experienced DM, or the Organized Play judge who needs to liberty to adapt to groups that go off the beaten path. Many of those polled on Twitter seemed partial to bullet points, which we’ve used periodically in adventures. However, that solution forsakes inexperienced Game Masters, lazy GMs, and tradition. Perhaps what is needed is a combination of two approaches. A block of read aloud could have a couple sentences to convey the most basic details, or to allow a transition into dialogue by a non player character. After that, the most vital information could be part of a series of bullet points. This approach has the advantage of providing the DM with a useful transition, while not diverting his or her attention away from the table for too long, or putting too many words that sound awkward in his or her mouth. Ultimately, it would be great if every Dungeon Master were equipped with the know-how to create instantaneous descriptions that conveyed the mood and details of a scene. However, we must appeal to a gamut of Game Masters, so perhaps am approach that takes into account the wide variety of DM is best. The forest clearing is deserted except for an animal carcass lying in the middle. The grass is trampled, and the foliage is smeared with gore. • The animal carcass is a female dear. It has deep claw gashes in it. • The blood on the foliage is fresh. • The grass is heavily tread upon, as though by several large creatures. • A trail of gore leads into an opening the woods. • The creatures that killed the dear left tracks. The tracks were left bipedal, wolf-like creatures (Nature moderate). Of course, more of this information could be associated with skill checks, but I’d caution against using that mechanic too heavily. One wouldn’t want to make all of these pieces of information require skill checks, because it could resulting in stymieing the flow of the story. I’ll leave that discussion for another day, though. Anyone who has played prior editions of Dungeons & Dragons has likely experienced the pleasure and pain of random encounter tables. The idea of the wandering monster is a staple of D&D, harkening back to the earliest days of the game. My experience with random encounters began in third edition, when my Dungeon Master would make us measure every agonizing mile of travel, rolling on the appropriate terrain table to determine what we would encounter. 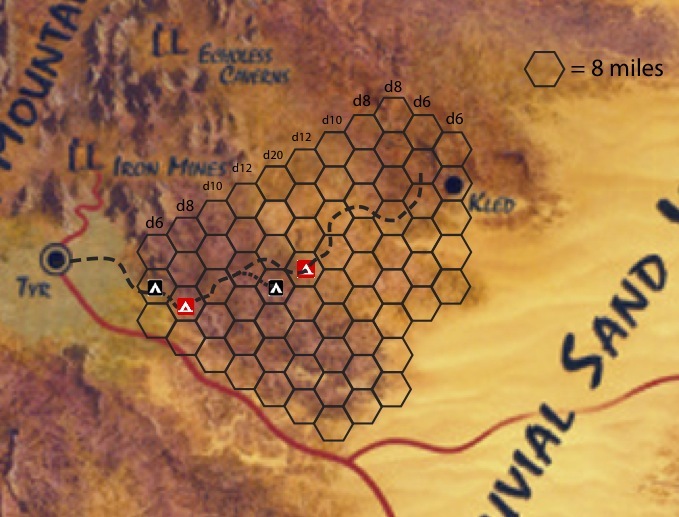 As a result, the group ended up spending more time dealing with inane wilderness encounters than participating in the larger story. The random encounters I remember from that time are those that had a nugget of plot—some element that hinted at the larger story or provided a glimpse into the intricacies of the world. For example, at one point during our group’s travels, we encountered a rogue eidolon, which had been created by an ancient sect of corrupt druids. The eidolon was mad and kept carving the same phrase into the wall, “Tyrael Cast Down.” We had no idea what it meant, and only months later did the phrase make sense. Random encounters can provide a Dungeon Master a useful “breather” between adventures. He or she can set up a table of random encounters and rely on it to keep the players busy for a few sessions while laying the groundwork for the next city or dungeon. On the other hand, too many random encounters—or those that are an obvious attempt to stall the game—can provide an unsatisfying experience for the players. I recently made my first 4th edition foray into random encounters and wilderness travel in my Dark Sun game. I normally forgo random encounters, glossing over the days and weeks spent traveling between locations, but I felt the Dark Sun setting mandated different treatment. To that effect, superimposed a hex grid over a map of the wilderness region outside the city of Tyr. Each vertical column of hexes had a corresponding die (d6, d8, d10, d12, and d20), which I rolled once per four hours of character travel to determine what the party encountered. On my encounter table, the higher numbers represented the harder encounters, so as the characters delved farther into the wilderness, their chance of getting challenging encounters rose. I also had the characters make regular Perception and Nature checks to ensure they stayed on the path. Whenever the party fails, it veers either north or south. The more failed checks, the more off the path they get—potentially leading them to travel in circles or get lost in the wilderness. 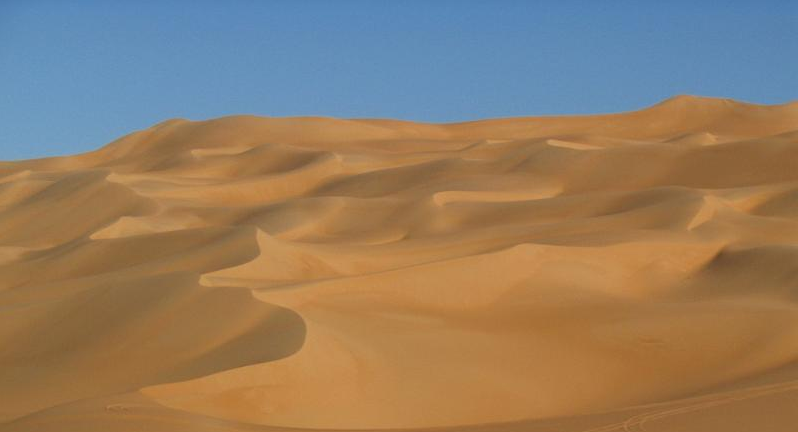 Although this little bit of verisimilitude might seem harsh, I think it provides a sense of peril that is paramount in a Dark Sun campaign travel and exploration. In the world of Athas, where the vast majority of the landscape is hostile wilderness, a table of random encounters just makes sense. It lets the players get a sense of the threats outside of the city-states. The travels also give the members of the party valuable downtime, in which they can bond, discuss their plans or back-stories, or engage in tasks like crafting. It also gives them exposure to many of the monsters of the world, helping to build a lexicon that makes their social encounters in the city more comprehensible. I was not content to simply rely on a table of random creatures, though. A few of the encounters were strictly combat encounters unrelated to the larger plot, but some were also social encounters or encounters that related to the characters’ quests. I used a table of random wilderness encounters I found on a Wizards Community board combined with the fantastic terrain from the Dark Sun Creature Catalog to create the table. I added short descriptions to provide reminders of what made the encounter interesting. During the session, I improvised the details, fleshing out the encounter on the fly. After the first game session of travel, I asked my players how they liked the wilderness travel, and whether they wanted to continue to have sessions that were exclusively travel and random encounters. They agreed that as long as the sessions continued to have some exploration, roleplaying opportunities, and threads connected to the plot, they were happy to continue.